Slice the chicken breast into strips, about 2 or 3 per breast. Season with salt and pepper. Spray a baking dish with cooking spray and spread half the pesto on the bottom of the dish. 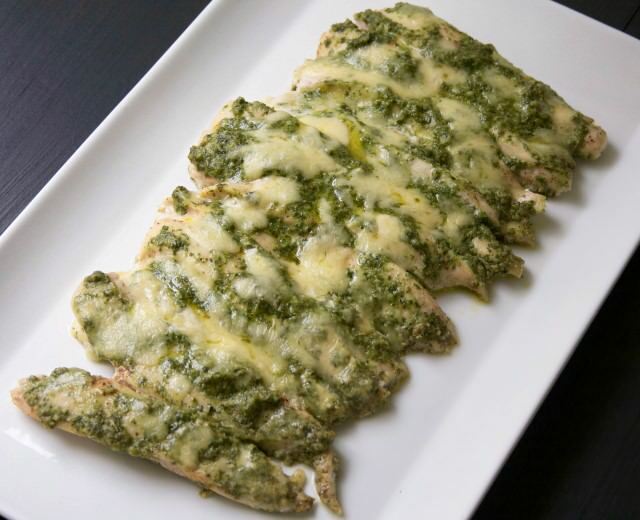 Lay the chicken strips over and cover with the remaining pesto. Cover the baking dish tightly with foil and bake for 25 to 30 minutes. Remove the foil and sprinkle the mozzarella over the chicken. Bake for a further 5 minutes until the cheese is melted.